Scientists Take Quantum Steps Toward Teleportation "Quantum entanglement" may sound like an awful sci-fi romance flick, but it's actually a phenomenon physicists say may someday lead to the ability to teleport an object all the way across the galaxy instantly. Christopher Monroe of the Joint Quantum Institute sits before a 16-by-4-foot table covered in optical equipment. His team has been able to "teleport" an atom a distance of about one meter. "Quantum entanglement" may sound like an awful sci-fi romance flick, but it's actually a phenomenon that physicists say may someday lead to the ability to teleport an object all the way across the galaxy instantly. It's not exactly the Star Trek version of teleportation, where an object disappears then reappears somewhere else. Rather, it "entangles" two different atoms so that one atom inherits the properties of another. "According to the quantum theory, everything vibrates," theoretical physicist Michio Kaku tells NPR's Guy Raz. Kaku is a frequent guest on the Science and Discovery channels. "When two electrons are placed close together, they vibrate in unison. When you separate them, that's when all the fireworks start." This is where quantum entanglement -- sometimes described as "teleportation" -- begins. "An invisible umbilical cord emerges connecting these two electrons. And you can separate them by as much as a galaxy if you want. Then, if you vibrate one of them, somehow on the other end of the galaxy the other electron knows that its partner is being jiggled." This process happens even faster than the speed of light, physicists say. Quantum entanglement isn't a new idea -- Einstein once famously referred to it as "spooky action at a distance" -- but it wasn't until the past 30 years that scientists were first able to observe this process. It could one day lead to new types of computers, and some even think entanglement may explain things like telepathy. Scientists aren't quite ready to beam up Scotty yet, but this is the technology that one day may lead to such a feat. 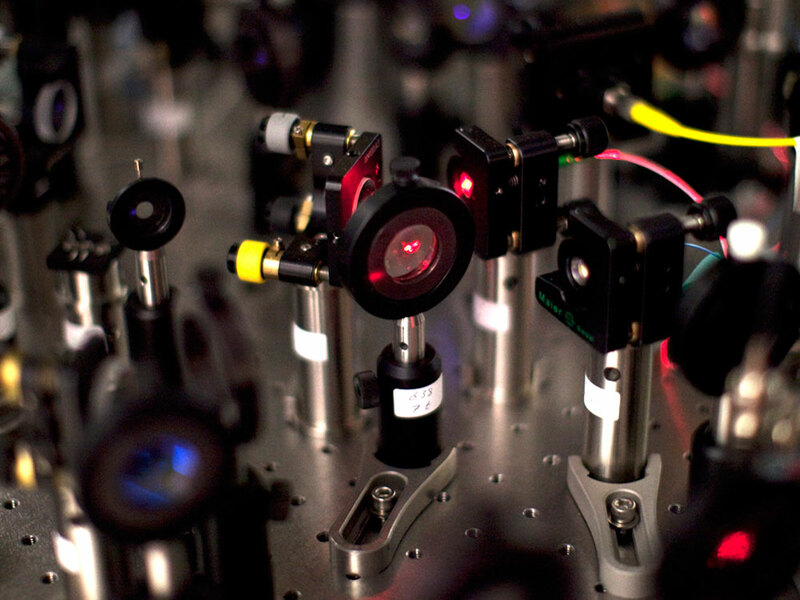 Mirrors and lenses direct lasers at atoms to catalyze entanglement. 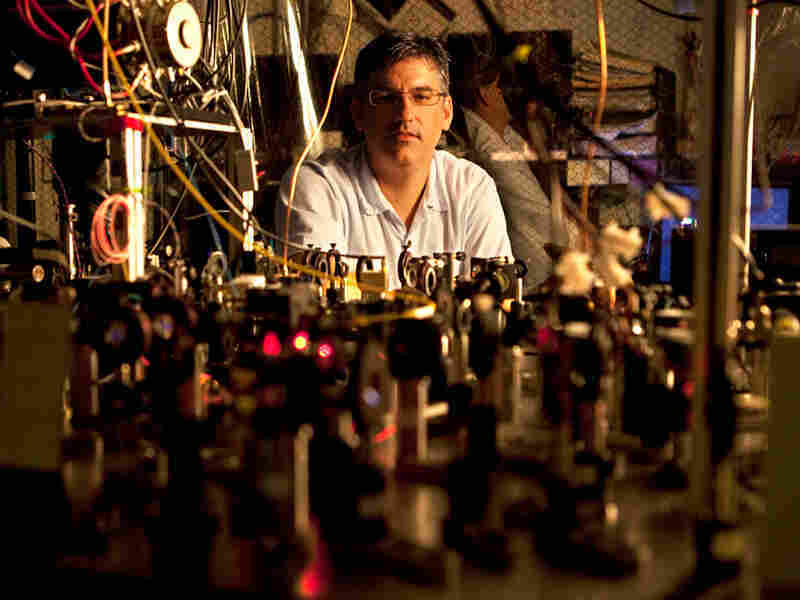 The work is being pioneered at places like the Joint Quantum Institute at the University of Maryland. In a basement lab, scientist Christopher Monroe has successfully managed to "entangle" two atoms approximately one meter away from each other. "It's fun being on the fringe," Monroe says. "This discipline, we don't know where it's going. And that drives me every day." But Monroe's work is a long way from being able to teleport a living being. The problem with such an act, Kaku says, is that "you have to be destroyed in order to have your body teleported to the other side of the room. So if you've been destroyed and teleported, then who is that person there? They have the same memory, the same jokes, the same everything, except the original was destroyed in the process of being teleported." So if one was to be teleported, would he or she simply be re-created but not able to tell the difference? Stay tuned to the Joint Quantum Institute website to see if they ask for volunteers. This story was reported by NPR's Brent Baughman.